Surgical approach towards facial nerve has to be done with caution as many surgeons are unfamiliar with the anatomy of the facial nerve as it dived down towards the IAM. The present study is essential as bony structures are rigid and more suitable as anatomical guides so as to assess the anatomical relationship from IAM to superior petrosal sinus, sigmoid sinus, aqueduct of vestibule and the jugular foramen preoperatively by High contrast CT scan and MRI wherein the surgical approach can be individually tailored minimizing the risk during surgical interventions like acoustic neurinomas, cholesteatomas, jugular foramen tumors, stapedectomy, temporal bone malignancies, and cochlear implants. The present study is carried out on 100 temporal bones (dried and cadaveric) from the department of anatomy at Goa Medical College, Bambolim, Goa, India by examining the foramen of internal acoustic meatus of the right and the left sides of both the sexes. Each foramen was carefully examined and its relation to the following important anatomical landmarks was measured in millimeters of both the sides. From the above table our present study reveals the distance in millimeters between the IAM to superior petrosal sinus, sigmoid sinus, aqueduct of vestibule and jugular foramen. When our data was analyzed it was found that the distance from IAM to superior petrosal sinus was 4.5 mm, IAM to sigmoid sinus was 24.08 mm, IAM to aqueduct of vestibule was 10.47 mm and IAM to jugular foramen was 8.6 mm. Our finding shows the difference in the above parameters when compared to the findings of Krajewski et al. as shown in [Table 1]. The anatomical landmarks selected must be reliable and above all easy to identify. Bony structures are more suitable than soft tissue or cartilaginous landmarks because of their rigid and reliable location. The anatomical relationship of the facial nerve in temporal bone is well known in surgical anatomy; , however, no much studies are being done regarding the distance from IAM to its neighboring normal anatomical structures. Surgery of the facial nerve is usually undertaken in schwannomas, trauma which is either iatrogenic  or after fracture of the temporal bone. In our present study, we have measured the distance of IAM to its various normal important anatomical landmarks (superior petrosal sinus, sigmoid sinus, aqueduct of vestibule and jugular foramen) which are encountered during the surgical intervention. The retrosigmoid approach involves a posterior fossa craniotomy behind the sigmoid sinus. The middle fossa approach involves a temporal craniotomy wherein superior petrosal sinus which runs along the petrous ridge may be injured. Glomus jugular tumors can be removed completely only by displacement of facial nerve anteriorly and superiorly away from the region surrounding the jugular bulb. , Surgical corrections of the Enlarged Vestibular Aqueduct Syndrome which is characterized by a widening of the vestibular aqueduct, associated with sensorineural hearing loss, or sometimes with mixed hearing loss, which may be congenital or acquired during childhood. ,, Studies also reveal that the distance from posterior margin of the sigmoid sinus to the fundus of the inner ear was 20 mm in 47% and 30 mm in 5%, air cells in posterior lip of meatus were 24% and in 3% jugular bulb reached up tom or above the level of IAM. 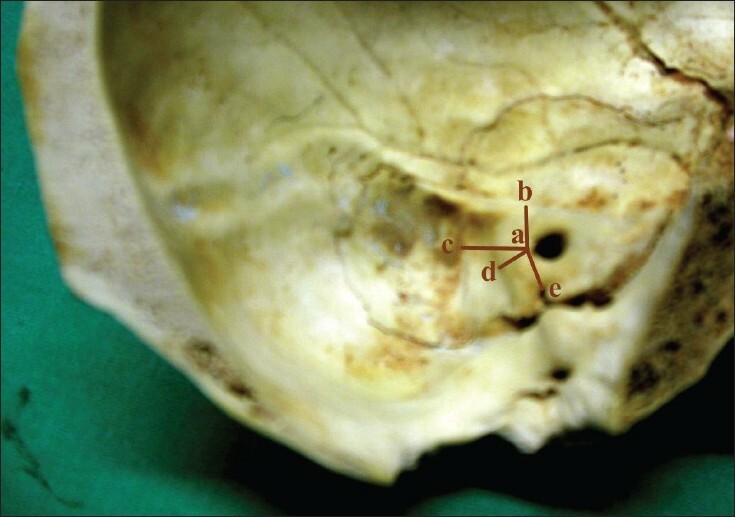 The present study reveals the distance in millimeters between the IAM to superior petrosal sinus, sigmoid sinus, aqueduct of vestibule and jugular foramen which was 4.5 mm, 24.08 mm, 10.47 mm, and 8.6 mm, respectively. There may be variations in the distances from the landmarks in living as per the body compositions as this study was performed on fixed cadaver material and the same needs to be studied in vivo as thorough knowledge of the distance between the IAM to important anatomical landmarks is basic and very important to the surgeons and radiologists before and during surgical intervention. 2. Ammirati M, Ma J, Cheatham ML, Maxwell D, Bloch J, Becker DP. Drilling the posterior wall of petrous pyramid: A microsurgical anatomical study. J. Neurosurg 1993;78:452-5. 3. Blevins NH, Jackler RK. Exposure of lateral extremity of the internal auditory canal through retrosigmoid approach: A radioanatomic study. Otolaryngol Head Neck Surg 1994;111:81-90. 4. Roscic Z. Conservative parotidectomy: A new surgical concept. J Maxillofac Surg 1980;8:234-40. 5. du Ru JA, van Benthem PP, Bleys RL, Lubsen H, Hordijk GJ. Landmarks for parotid gland surgery. J. Laryngol Otol 2001;115:122-12. 6. Donaldson J, Ducker L, Lambert P, Rubel E. Surgical anatomy of temporal bone. 4 th ed. New York: Raven Press; 1962. 7. Schuknecht HF, Gulya J. Anatomy of the temporal bone with Surgical implications. Philadelphia: Lea and Febiger; 1986. 8. Green JD, Shelton C, Brackmann DE. Iatrogenic facial nerve injury during otologic surgery. Laryngoscope 1997;104:922-6. 9. Brodie HA, Thompson TC. Management of complications from 820 temporal bone fractures. Am J Otol 1997;18:188-97. 10. Blevins NH, Jackler RK. Exposure of lateral extremity of the internal auditory canal through the retrosigmoid approach: A radioanatomic study. Otolaryngol Head Neck Surg 1994;111:81-90. 11. Jackler RK, Brackmann DE. An overview of the facial nerve surgery. 2 nd ed. Nerotology. Missouri: Mosby; 2005. p. 1215. 12. Fisch U. Infratemporal fossa approach for glomus tumors of the temporal bone. Ann Otol Rhinol Laryngol 1982;91:1217-25. 13. May M, Klein SR. Facial nerve decompression complications. Laryngoscope 1983;93:299-305. 14. Pinto JA, Mello CF Jr, Marqui AC, Perfeito DJ, Ferreira RD, Silva RH. Enlarged vestibular aqueduct syndrome: Report of 3 cases and literature review. Braz J Otorhinolaryngol 2005;71:386-91. 15. Levenson MJ, Parisier SC, Jacobs M, Edelstein DR. The large vestibular aqueduct syndrome in children. A review of 12 cases and the description of a new clinical entity. Arch Otolaryngol Head Neck Surg 1989;115:54-8. 16. Madden C, Halsted M, Benton C, Greinwald J, Choo D. Enlarged vestibular aqueduct syndrome in the pediatric population. Otol Neurotol 2003;24:625-32. 17. Krajewski R, Kukwa A. Skull Base Surgery. New York: Thieme Publishers; 1999. p. 81-5.